I love the works of Penelope Fitzgerald and have read a good many them. This one came as a surprise to me though, when it was selected as a Booker nominee – I don’t know why I hadn’t read it before. 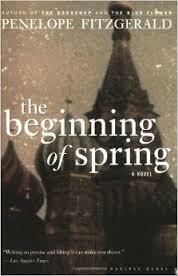 I suspect this historical fiction set in March, 1913 Moscow and environs was painstakingly researched, but Fitzgerald always keeps it natural focusing on the plot and character development first snd foremost. That said, the setting, both time and place, is an integral part of the story, affecting the characters profoundly. I think it could happen nowhere else. Moscow at this time was a place of serious unrest, student protests and labor strikes abounded, but things had quieted down some from the rebellion of 1905 and World War I had not yet started. It was hoped that a revolution could be avoided. Frank Reid is an English print shop owner who was raised in Moscow because his father had opened a business there. Reid goes to England for his schooling and when his parents die he marries Nellie who accompanies him back to Moscow and bears him three great children. Then one March day she takes the children and leaves him – she returns the children almost immediately. The rest of the book is the story of Frank Reid’s time in Moscow during this very complex era, managing his business, a home staff and hiring a nanny for the children. He has several interesting friends including Selwyn Crane, a Trotskyite, Mrs Graham, an eccentric Englishwoman and the wife of a poor chaplain, and Korobyev, a business friend. There are parts of this novel which are distinctly funny, other parts which are quite sad. There is one section, later in the book which remins me of Boris Pasternak’s Doctor Zhivago, other parts remind me of Coetzee’s Petersburg – St Petersburg around the same time but written in the late 20th century. If you enjoy historical fiction about this time frame or are a fan of Penelope Fitzgerald and Booker Prize type books – go for it!